Both private medical insurance, such as coverage offered from Blue Cross and Blue Shield and government insurance programs, such as Medicare and Medicaid, use “fee schedules” or other formulas to determine the amount they will pay for particular medical procedures and services. Private insurers and government programs will declare the maximum amount they’ll pay on behalf of the insured patient for an MRI, for example. These fee schedules or formulas limit the costs insurers incur and help medical providers budget for their expected revenue for providing services paid by third parties. 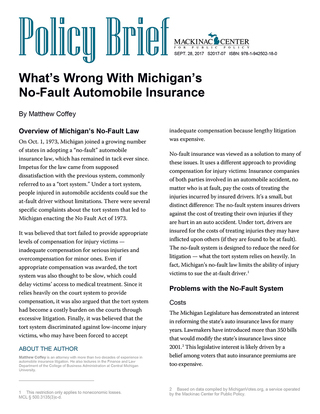 Michigan’s No Fault Act, however, provides no such fee schedules or formulas nor sets any specific limits on what auto insurers must compensate medical providers for certain procedures and services. As a result, medical providers under PIP can bill whatever amount they deem “reasonable,” defined as what would be charged for the same product or service when there is no insurance coverage. This is one reason why it is not uncommon for auto insurers to pay medical providers significantly higher amounts for the same service or procedure compared to what is paid by health insurance companies and government programs like Medicare and Medicaid. The Detroit Free Press recently analyzed these differences and found medical providers charging auto insurers up to 10 times more than they are paid by Medicare for the exact same service. Specifically, the paper found MRI providers charging about $5,000 for a single MRI when billed to an auto insurers. Meanwhile, Medicare pays about $500 per MRI scan and hospitals in Michigan typically charge between $1,900 and $2,600 per MRI. Third-party payment systems that are used to pay for insurance claims reduce the incentives for consumers to be price-conscious. This is one reason fee schedules and HMO and PPO plans are commonly used in the health insurance industry. They help contain the costs that medical providers charge insurers, because consumers cannot provide that pressure themselves like they would in most other markets. Medical providers have no such limits when it comes to settling claims from automobile injuries, and this is a key contributor to the high cost of auto insurance in Michigan. MCL § 500.3107(1)(a); MCL § 500.3157. JC Reindl, “How Aggressive Lawyers, Costly Lawsuits and Runaway Medical Bills Make Detroit Car Insurance Unaffordable,” Detroit Free Press, May 6, 2017, https://perma.cc/JD4S-MVCE.